Ongoing Experimental Bone Breakage Research: We began analysis of the cow limb bones that were broken experimentally by dynamic loading (impact) and static loading (steady pressure) to continue to test the hypothesis that notches created by these two processes can be differentiated. Our most recent analysis shows that a ratio of notch breadth to notch depth does demonstrate statistically significant differences in notch shape depending on whether they were made by impact percussion or static pressure. We are growing a data base of notch measurements from various species of Pleistocene and modern animals for comparison. Our preliminary research indicates that certain notch measurements represent signs of human technology. SAA 2015: CAPR was represented at an exhibition booth at the annual meeting of the Society for American Archaeology April 15-19, 2015. Several posters discussing CAPR research were shown at the booth. Special Honor: The Colorado Scientific Society presented their Best Paper Award for 2014 to Steven and Kathleen Holen. Their presentation was a summary of CAPR research identifying evidence of early peopling of the Americas from archaeological sites and experimental bone modification. Chiquihuite Cave is a high altitude cave situated atop the Astillero Mountains, not far from the Tropic of Cancer beneath Chiquihuitillo, one of the highest peaks in Northern Mexico (3200 meters.above.sea.level, m.a.s.l.). The cave itself is located at 2740 m.a.s.l. at the base of a cliff, with its entrance overlooking the southeastern end of a long, narrow basin in the now arid region in the northeast of the State of Zacatecas. The cave is large, with at least two wide and tall chambers and a very narrow entrance looking west. It is still active, meaning that there is still dripping inside, and speleothems (mineral cave deposits) are still forming. The site is very difficult to reach, as it stands at over 1000 m above the surrounding valleys, atop a very steep slope covered in dense desert vegetation and loose limestone boulders deposited by millennia of constant erosion of the surrounding cliffs. To reach the cave one must walk from the nearest village along a wide and high alluvial fan, then climb the barely visible path opened with machetes through the bushes and agaves. Patches of pinyon trees and small oaks still remind us of the ancient landscape, when the basin below held a lake and marshes. The journey to the cave can take as much as 9 hours but there is no feasible way to reach it other than crawling up the steep slope. The cave is now registered as an archaeological site, and has potential to contribute to the study of American prehistory in general, and the American Paleolithic in particular. Familiar to the locals since at least the early 20th century when the village, Guadalupe Garzarón was founded, Chiquihuite Cave was completely unknown to scientists until first shown to archaeologists in May 2010. The region itself had never been explored before. That year, Dr. Ciprian Ardelean (lecturer at the University of Zacatecas in Mexico and research fellow at the University of Exeter, UK) started a major archaeological project in the adjacent basin, looking for hunter-gatherer sites and Pleistocene human occupations. After three completed field seasons, this ongoing investigation revealed almost 40 new hunter-gatherer sites. Through intense surface explorations and initial test excavations, several localities proved of primary importance for the goals of the project and justified further research. 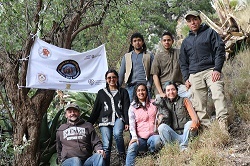 Dr. Ardelean’s initial research findings at Chiquihuite Cave, presented at a recent Society for American Archaeology conference, came to the attention of the Center for American Paleolithic Research (CAPR) which subsequently became involved in supporting further archaeological explorations of that remote place in the highlands of Mexico. Digging the cave is very difficult, but an exciting and adventurous enterprise. Work is better done in winter, when the region is drier. 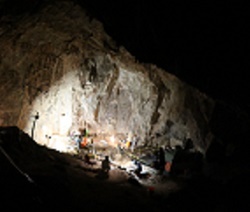 The crew must live inside the cave full-time, for weeks or months at a time. All supplies, drinking water and equipment must be carried up in one single event, engaging dozens of local people and animals. Long caravans of donkeys and mules escalate the rugged slope to the cave, carrying tons of materials. The camp is set inside the cave, next to the dig and away from the chilling winter weather. Dr. Ardelean’s crew, mainly dedicated archaeology students, works up to 12 hours a day and cooks their own food in the kitchen installed at the drip line of the cave. A complex network of electric wires and powerful LED lights connected to an eco-friendly power generator allow work to continue day and night. The first test excavations were undertaken in January 2011, near the northern wall of the main chamber, and yielded the first indicators of possible human presence there long before the Last Glacial Maximum. Two subsequent field seasons, lasting almost 100 days between December 2015 - February 2016 and December 2016 - January 2017, were supported by CAPR and the Zacatecas Government. The results of these excavations in Chiquihuite Cave are being prepared for publication, but we can report here that the latest findings have confirmed the existence of an older-than-Clovis cultural component in the deposits of the cave, as well as strong indications for a pre-LGM occupation. SAA 2017: Join CAPR in Vancouver, B.C., Canada, March 29- April 2. CAPR archaeologists will present posters documenting our latest research. Holen SR and Holen K. The mammoth steppe hypothesis:The middle Wisconsin (Oxygen Isotope Stage 3) peopling of North America. In: Graf EG, Ketron CV and Waters MR, editors. Paleoamerican odyssey. College Station: Texas A&M University, 2013; p.429-444. Holen SR. Clovis lithic procurement, caching, and mobility in the Central Great Plains of North America. In Huckell BB and Kilby JD, editors. Clovis caches: Recent discoveries and new research. Albuquerque: University of New Mexico Press, 2014; p. 177-200. CAPR is a tax exempt 501(c)(3) non-profit. will be gratefully and promptly acknowledged.